We introduce Problem Solving as Code as a process of developing, managing, and provisioning problem-solving methods and tools. 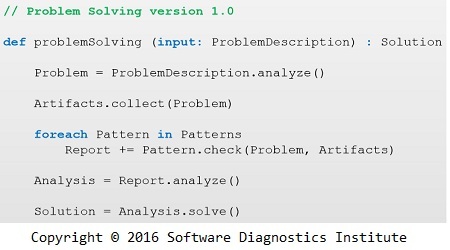 Some problem-solving methodologies such pattern-oriented problem solving developed by Software Diagnostics Institute as a part of Diagnostics Science require constantly evolving pattern catalogues which can be stored in version control systems. For example, pattern-oriented software problem solving involves pattern-oriented problem description analysis and software execution memory and trace artefact acquisition, pattern-driven and pattern-based software diagnostics (including forensics), the patterns-based root cause analysis, and pattern-oriented debugging process which introduced design methodology to debugging. In addition to general problem patterns and problem analysis patterns, there are concrete problem and problem analysis patterns where concrete problems are constantly changing (traditional problem repositories). PSaC (“Problem Sack”) allows using declarative and imperative problem-solving configurations tailored for specific problem domains or specific systems and products by customising pattern catalogues. Specific problem artefact types may require specialized tools and configuration so they can also be designed, developed, managed and provisioned. For example, pattern-oriented problem solving includes DebugWare and DiagWare design patterns.